Fifth installment of the vampire franchise. Kate Beckinsale is an actor whose talents I've struggled to measure throughout her career. Few stars of her status boast such a poor CV, and she seems attracted to a specific type of bad movie - Van Helsing, Total Recall, Whiteout - that any actor who can read a script should know to steer clear of. It was only last year, thanks to her lead role in Whit Stillman's caustic Jane Austen adaptation, Love & Friendship, that I finally realised she's a fantastic performer when given worthwhile material. Any hopes that Stillman's movie might represent a turnaround in Beckinsale's career seem tragically naive. Since Love & Friendship she's appeared in straight to VOD horror The Disappointments Room and this fifth installment in the bafflingly successful Underworld franchise. 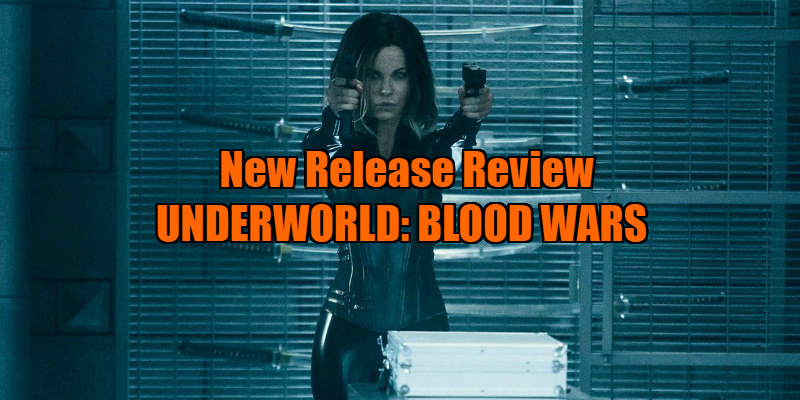 Underworld: Blood Wars helpfully opens with a recap of the series that allows those viewers who bailed out after the first movie to get caught up. Previously, Beckinsale's vampire Selene hid her daughter in a location she herself is unaware of. The Lycans (that's werewolves for those of you who weren't monster kids) want to capture Selene's kid and use her blood to form an army of vampire-werewolves. The glaring issue with this setup is that the protagonist doesn't have the information the villains are after, so it makes for little in the way of drama. There's no fear of Selene betraying her daughter's whereabouts, because she's simply not privy to them. But let's face it, the people behind this franchise have about as much interest in the series' plot as its fans do. This is a saga that exists to sate the desire of a certain audience to watch vampires battle werewolves while British brunettes choke baddies between their leather clad thighs. Sounds pretty good, right? Sadly, it fails to satisfy even this base requirement, as it takes itself so bloody seriously. The setup of Underworld sounds like a riot, but over five movies the fun has been drained out of this franchise like blood from the jugular of Dracula's date. Only Lara Pulver, as a traitorous vamp, embraces the campness of this premise. When she's not receiving head from young vampire hunks, she's prowling through the movie's badly lit sets like some hot-blooded hybrid of Eva Green and Ingrid Pitt. The only thing lower than her necklines is the film's Rotten Tomatoes score. The plot hints at an epic bloodsucking catfight between Pulver and Beckinsale, whose leather leotard must really stink by this point, but it never happens, because that would be too much fun, and we can't have any of that in the Underworld series. Underworld: Blood Wars is in UK/ROI cinemas January 13th.